The site of the former Tudhoe Grange School, which closed in July 2012 to join with Spennymoor School as joint founders of Whitworth Park School and Sixth Form College, will find a new lease of life thanks to a new series of prime-time BBC police drama Inspector George Gently. The series, which stars Martin Shaw, Lee Ingleby and Simon Hubbard, is based on characters created by Alan Hunter. The TV series based on those stories, produced by Company Pictures for BBC One, relocated the detectives from Norfolk to Northumberland and Durham. Series five ended on a cliffhanger, with the fate of the leading characters uncertain, but in September 2012 Peter Flannery, lead writer on the series confirmed that a new series of four, ninety minute episodes had been commissioned. For the last few months cast and crew have been based in their new home at Tudhoe Grange School’s former lower school site on Durham Road, which has not only become the police station from which the leading characters work, but also provides offices and a production base for the company. Filming at region-wide locations took place from March until early June, and the series, which has a regular audited viewing figure of about seven million, will air in autumn this year. 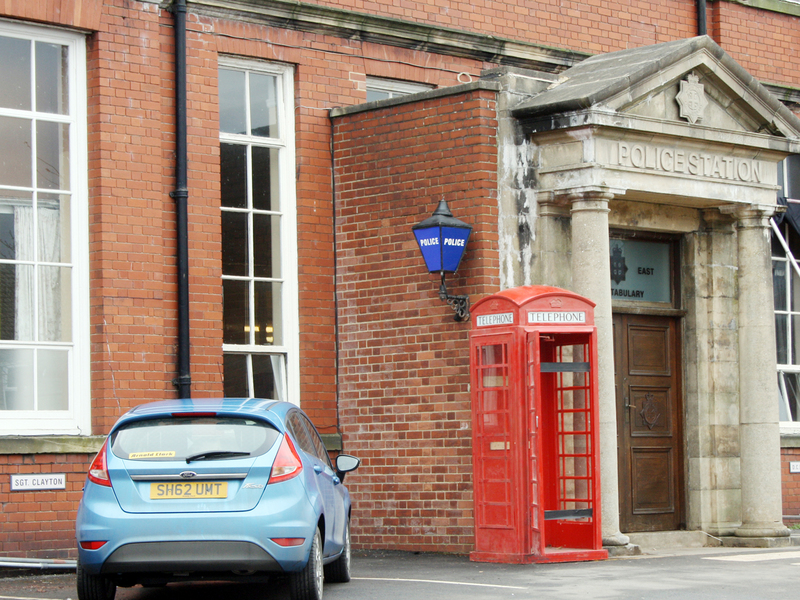 To suit the series the entrance to the building has been altered dramatically: the familiar double doors now boast the legend ‘North East Constabulary’ etched into the glass pane above them, with the words ‘POLICE STATION’ engraved in the stone portico; a blue police lamp shines at the side, and an iconic red telephone box is sited below that, with parking spaces assigned to leading characters, and a number of period vehicles have been spotted, parked outside the building.